Emirates Airline today announced it will deploy its highly-popular A380 to even more destinations across its network in 2016 – reinforcing its commitment to provide an enhanced onboard experience for its passengers. Birmingham (BHX), Prague (PRG) and Taipei (TPE) have been added to the growing list of Emirates A380 destinations, making Emirates the first and only airline to operate a scheduled A380 service from each of these destinations. Emirates’ daily Birmingham flight, EK39/40, will be up-gauged to an A380 beginning 27th March 2016. Emirates A380 services to Prague and Taiwan will start from 1st May 2016. Additionally, Barcelona will be served with a second daily Emirates A380 service from 1st June 2016. “The introduction and increase of Emirates’A380 services in these strategic destinations means more travellers will have the opportunity to experience our industry-leading A380 product,” Thierry Antinori, Executive Vice President and Chief Commercial Officer, Emirates, said. “Our onboard innovations on the A380, across all classes, continue to impress and delight our customers. Deploying larger capacity aircraft, such as the A380, also helps us to efficiently meet growing passenger demand in these markets, contribute to tourism development and enhance customer choice and options,” Thierry Antinori added. Flying the world’s largest fleet of A380 aircraft at 71, Emirates continues to set the pace for A380 deployment. 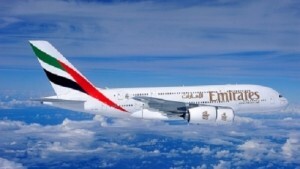 Since Emirates launched is first A380 flight in 2008, the aircraft has flown over 42 million passengers, covering more than 630 million kilometres. Passengers in all classes can enjoy access to over 2,000 channels of films, TV shows, music and games through ice, Emirates’ award-winning inflight entertainment system, as well as free Wi-Fi and gourmet cuisine. There are currently 36 A380 destinations on the Emirates network, setting the industry benchmark for both A380 connectivity and customer experience.